No ladder required in this little home. Love the idea of a tiny home, but not the tiny square-footage? ZeroSquared, a Calgary-based company, has come up with tiny home model that is flipping the script on tiny home living — with only one touch of a button. 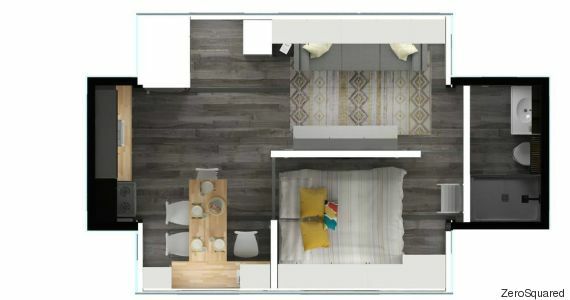 The Aurora tiny home will expand using motorized slide-outs, immediately creating more living space. In fact, the home will almost double in width — going from 8.6 feet to 15.1 feet wide and offering a total 337 sq.-ft. of living space. It's similar to RVs that do the same thing, but you won't find any faux-wood paneling, tacky wallpaper, or cheap vinyl in this beautiful home. "We want to give our society affordable/sustainable housing options that are beautifully designed and comfortable as well," ZeroSquared spokeswoman Melissa Buzan said in an email. "We created a tiny home we could all see ourselves living in." The Aurora is under development and will sell for just over $98,000. Only 10 units will be built initially, with the potential for more in the future. The home is designed to be environmentally-friendly, as well, with structural insulated panels, a solar energy system, and a composting toilet for off-grid use. Check out more of the home’s details in our video above!